Is it okay to prune trees in the spring? In some instances, it may be okay. Learn more below! While we’ve all been admiring the growth of green outside so far this spring, perhaps you’ve noticed something as you’ve taken a look at your yard. Does it look like one of trees or shrubs is a little overgrown and could use a little trimming for better balance? We’ve discussed before why it’s important to prune trees in the fall dormant season – it prevents the spread of tree diseases and it’s generally easier to perform when all of the leaves have fallen off. But can you prune now, before the summer time? Let’s learn a little bit about spring tree pruning. 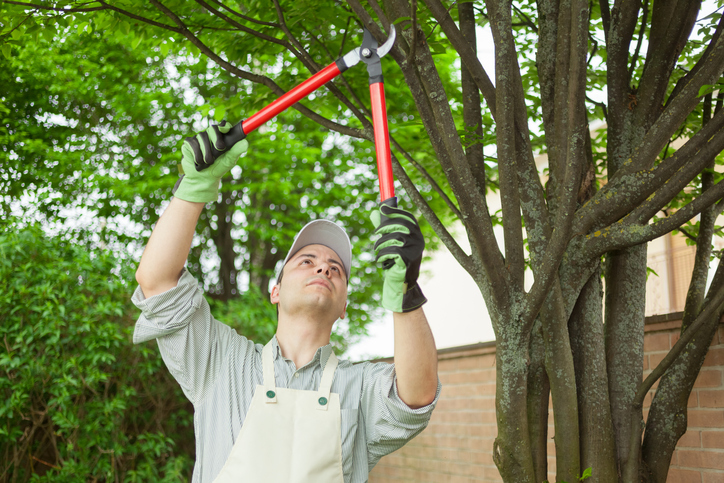 Pruning trees in the spring can be safely done as long as you don’t remove more than 10% of the tree branches in the process. Don’t try to do too much to the trees as you might be putting them at risk of disease or tree pest infestation. Your two main objectives should be removing any dead or decaying branches to keep the tree and your property safe as well as shaping the tree a little bit with minimal cuts. What Kind of Trees Are Better Suited to a Spring Prune? Young, recently planted trees are ideal for spring pruning because you can improve their structure as they continue to grow this way. In addition, maple, walnut, and birch trees are good candidates for a spring prune. In the winter, they tend to ooze sap when pruned – this is harmless, but some homeowners find this too messy for their tastes and prefer to wait until the spring so sap bleeding is reduced. Since spring pruning can increase the risk of the development of tree diseases and pest infestation, there are a few species that you shouldn’t touch in the spring. Oak, elm, sycamore, and honeylocust trees should not be pruned until the late fall as they are at an increased risk of developing problems in the spring. This entry was posted on Thursday, May 11th, 2017 at 2:30 pm. Both comments and pings are currently closed.